This week on The Football Coaching Podcast, we’re talking Multiple Front Defense with Jamelle Byrd. 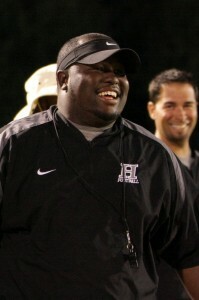 Coach Byrd is the Defensive Coordinator at Hough High School in Charlotte, North Carolina. Since helping to get the program off the ground in 2010, Coach Byrd has risen through the ranks. He helped Hough to their most successful season in 2012, making the school’s first State Playoff appearance. Multiple Front Defenses are a hot topic. We are always working to put our kids in the best position to be successful. Coach Byrd and the staff at Hough High School choose their defensive fronts each week based on the Offensive opponent. How can you do it? How can you put your kids in the best position each week, but keep them playing fast and confident too? We talk about fronts, coverage, blitz package, game planning and more with Jamelle Byrd, in Episode 59 of The Football Coaching Podcast!